Every cookie is a gift of love (wrapped in sugar and spice and all things nice). We show our love by baking cookies for friends and family. We give cookies as thank you gifts. We celebrate birthdays and holidays with cookies. We welcome new neighbors to the block with cookies. We cheer up our co-workers with homemade cookies. So by definition, cookies are never unnecessary. 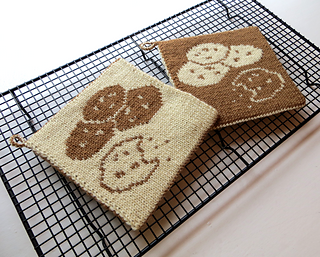 This potholder was designed in memory of Marwa Kandil. 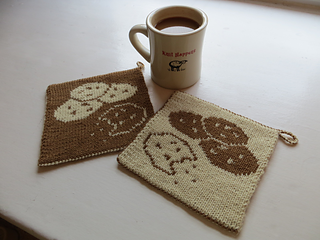 Working in the suggested yarn at the suggested gauge will produce a potholder approximately 6.25” x 6.25”. This can be altered by changing gauge or yarns. Sample was worked in Aran as the main color and Bev’s Bear as the contrasting color. One skein of each will yield two potholders. 50% of the proceeds from sales of this pattern will be donated to the Harry Potter Alliance in memory of our dear friend and cofounder, Marwa Kandil. The rest will benefit the establishment of the Steel City Fiber Collective. 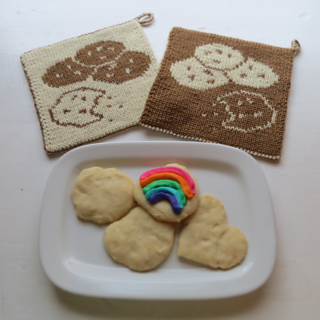 A month ago we released the Unnecessary Cookies potholder pattern with the promise that we would donate half the proceeds to the Harry Potter Alliance in honor of Marwa Kandil. Today, we kept that promise and donated $88 to HPA. Thank you everyone for your support and helping us to remember our friend.